From Lady Gregory’s Gods and Fighting Men, (1904). 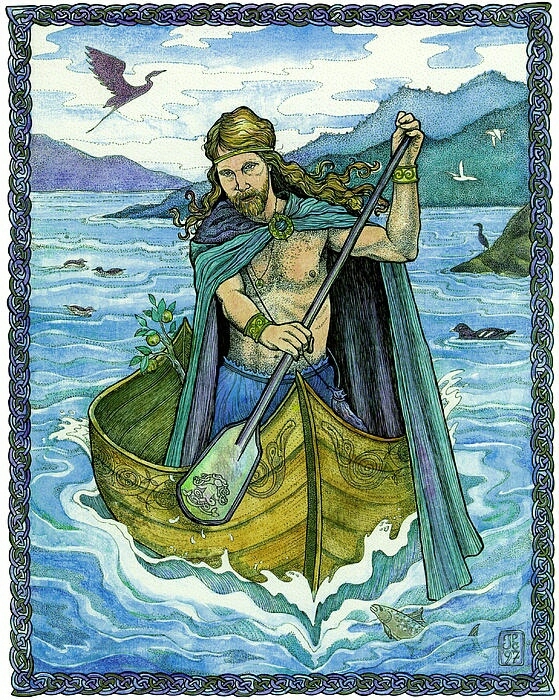 AND it is likely it was Manannan sent his messenger for Connla of the Red Hair the time he went away out of Ireland, for it is to his country Connla was brought; and this is the way he got the call. Then Coran, the Druid, began singing spells against the woman of the Sidhe, the way no one would hear her voice, and Connla could not see her any more. But when she was being driven away by the spells of the Druid, she threw an apple to Connla. And through the length of a month from that time, Connla used no other food nor drink but that apple, for he thought no other food or drink worth the using. And for all he ate of it, the apple grew no smaller, but was whole all the while. And there was great trouble on Connla on account of the woman he had seen. And when the woman had ended her song, Connla made a leap from his people into the shining boat, and they saw him sailing away from them far off and as if in a mist, as far as their eyes could see. It is away across the sea they went, and they have never come back again, and only the gods know where was it they went. by superhuman force, between old kingdoms. and sunset skies and racing shadows! of cairns of olden tyme and tales of long ago. murmurs the old god’s name. Lend a branch of silver to me. To part the veil ‘tween space and time. Lead us true, our imbas to find. Five streams from there Thy wisdom do bring. Drink ye deep from both streams and well. In Tir na n’Og does Manannan dwell. With Manannan’s branch assured is our way. We of good heart we never shall stray. Lead ever true, for this we do pray. We wind a path through the ancient lore. 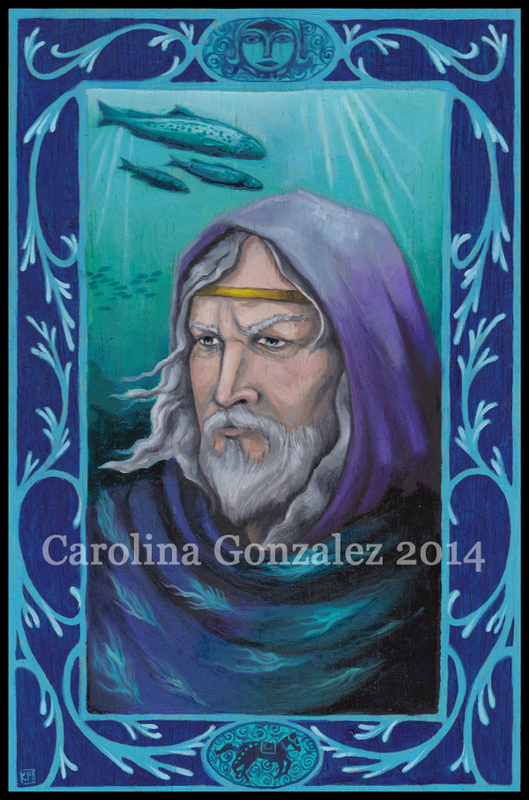 O Son of the Sea, Thy mist we adore. February for Manannan – 21 Happy News! Now, let’s hope they can find the fuckers who did it! I’d write more, but I’m sick for the third time this year. Yes. Sick thrice in the period of two months. Blech. This cold isn’t as bad as the first and definitely not as bad as the stomach bug, but still. 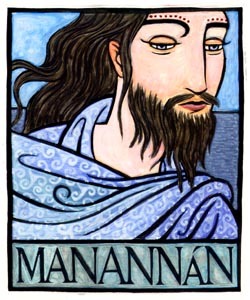 I will finish out the month of Manannan posts, so stay tuned! From Lady Gregory’s Gods and Fighting Men (1904). AND it was in the time of the Fianna of Ireland that Ciabban of the Curling Hair, the king of Ulster’s son, went to Manannan’s country. Ciabhan now was the most beautiful of the young men of the world at that time, and he was as far beyond all other kings’ sons as the moon is beyond the stars. And Finn liked him well, but the rest of the Fianna got to be tired of him because there was not a woman of their women, wed or unwed, but gave him her love. And Finn had to send him away at the last, for he was in dread of the men of the Fianna because of the greatness of their jealousy. 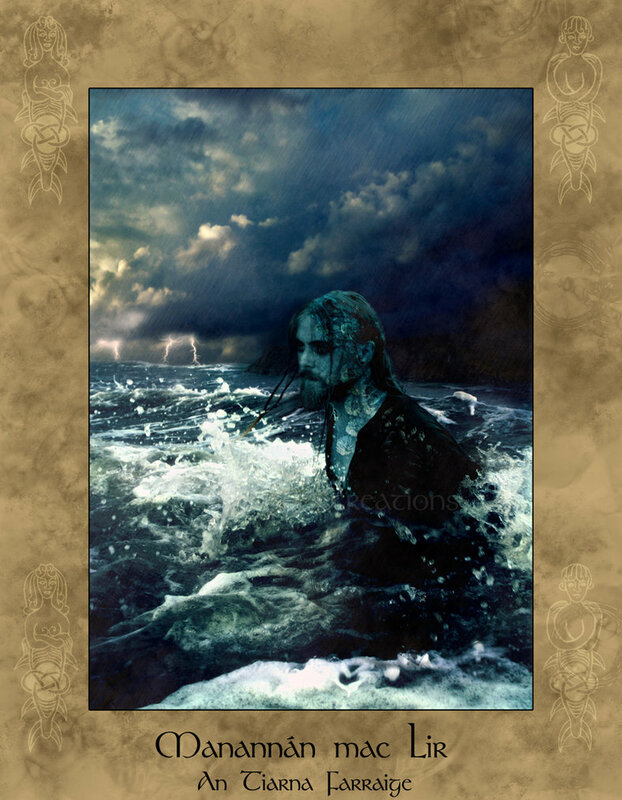 So Ciabhan went on till he came to the Strand of the Cairn, that is called now the Strand of the Strong Man, between Dun Sobairce and the sea. And there he saw a curragh, and it having a narrow stern of copper. And Ciabhan got into the curragh, and his people said: “Is it to leave Ireland you have a mind, Ciabhan?” “It is indeed,” he said, “for in Ireland I get neither shelter nor protection.” He bade farewell to his people then, and he left them very sorrowful after him, for to part with him was like the parting of life from the body. And he was in this danger till he saw a rider coming towards him on a dark grey horse having a golden bridle, and he would be under the sea for the length of nine waves, and he would rise with the tenth wave, and no wet on him at all. And he said: “What reward would you give to whoever would bring you out of this great danger?” “Is there anything in my hand worth offering you?” said Ciabhan. “There is,” said the rider, “that you would give your service to whoever would give you his help.” Ciabhan agreed to that, and he put his hand into the rider’s hand. With that the rider drew him on to the horse, and the curragh came on beside them till they reached to the shore of Tir Tairngaire, the Land of Promise, They got off the horse there, and came to Loch Luchra, the Lake of the Dwarfs, and to Manannan’s city, and a feast was after being made ready there, and comely serving-boys were going round with smooth horns, and playing on sweet-sounding harps till the whole house was filled with the music. Then there came in clowns, long-snouted, long-heeled, lean and bald and red, that used to be doing tricks in Manannan’s house. And one of these tricks was, a man of them to take nine straight willow rods, and to throw them up to the rafters of the house, and to catch them again as they came down, and he standing on one leg, and having but one hand free. And they thought no one could do that trick but themselves, and they were used to ask strangers to do it, the way they could see them fail. So this night when one of them had done the trick, he came up to Ciabhan, that was beyond all the Men of Dea or the Sons of the Gael that were in the house, in shape and in walk and in name, and be put the nine rods in his hand. And Ciabhan stood up and be did the feat before them all, the same as if he had never learned to do any other thing. Now Gebann, that was a chief Druid in Manannan’s country, had a daughter, Cliodna of the Fair Hair, that had never given her love to any man. But when she saw Ciabhan she gave him her love, and she agreed to go away with him on the morrow. And they went down to the landing-place and got into a curragh, and they went on till they came to Teite’s Strand in the southern part of Ireland. It was from Teite Brec the Freckled the strand got its name, that went there one time for a wave game, and three times fifty young girls with her, and they were all drowned in that place. And as to Ciabban, he came on shore, and went looking for deer, as was right, under the thick branches of the wood; and he left the young girl in the boat on the strand. But the people of Manannan’s house came after them, having forty ships. And Iuchnu, that was in the curragh with Cliodna, did treachery, and he played music to her till she lay down in the boat and fell asleep. And then a great wave came up on the strand and swept her away. And the wave got its name from Cliodna of the Fair Hair, that will be long remembered.